She’s leaning to one side;-) But, for what I can see her weight looks ok.
What is her history? Age? From a breeder(don’t name the breeder here),how long have you had her? I’m glad she is eating at least. Hopefully she will start gaining weight proportionally. Her legs and tail should be thicker. Hi, Looks like her shedding went well:) Did your gecko arrive from the breeder with the armpit bubbles or did she develop them after? 08:43 AM - Rose23 quoted acpart in post Eye Sunken In? Not Sure. 12:02 AM - Elizabeth Freer quoted Rose23 in post Geckos Too Warm?? How Can I keep the Cool End Cool in Hotter Months? 10:35 PM - Rose23 quoted Sg612 in post Eye Sunken In? Not Sure. 09:53 PM - Sg612 quoted Rose23 in post Eye Sunken In? Not Sure. 06:39 PM - Rose23 quoted Elizabeth Freer in post Geckos Too Warm?? How Can I keep the Cool End Cool in Hotter Months? 06:38 PM - Rose23 quoted Sg612 in post Geckos Too Warm?? How Can I keep the Cool End Cool in Hotter Months? 11:43 PM - Sg612 quoted Rose23 in post Geckos Too Warm?? How Can I keep the Cool End Cool in Hotter Months? 04:13 PM - Rose23 quoted Geecko123 in post Meet my Girls! 01:17 PM - Rose23 quoted Sg612 in post Crooked Toe? 11:40 AM - Rose23 quoted acpart in post Crooked Toe? 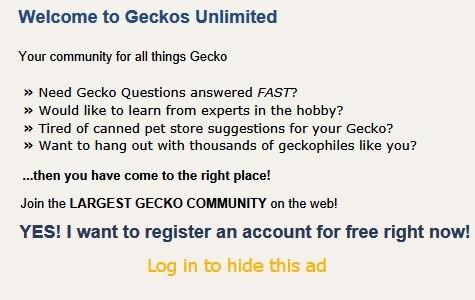 02:56 PM - Rose23 quoted Sg612 in post Are my Leopard Geckos overweight? 02:22 PM - Sg612 quoted Rose23 in post Are my Leopard Geckos overweight? 01:18 PM - Rose23 quoted Sg612 in post Are my Leopard Geckos overweight? 10:58 AM - Sg612 quoted Rose23 in post Are my Leopard Geckos overweight? 09:54 AM - Rose23 quoted Elizabeth Freer in post Are my Leopard Geckos overweight? 08:54 PM - Elizabeth Freer quoted Rose23 in post Are my Leopard Geckos overweight? 08:48 PM - Rose23 quoted Elizabeth Freer in post Are my Leopard Geckos overweight? 08:19 PM - Elizabeth Freer quoted Rose23 in post Are my Leopard Geckos overweight?